Rotifers are small invertebrates in the Phylum Rotifera.They range in size from 100 to 2500 microns, with approximately 2000 described species. Rotifers are found in aquatic and semi-aquatic habitats, but are predominantly freshwater inhabitants. Most species are free-living herbivores, bacteriovores or predators, and possess a ciliated, wheel-like organ for feeding and locomotion. Rotifers move by swimming or crawling. Some sessile species are permanently attached to freshwater plants. Internal anatomy of a rotifer. The major systems have been highlighted in color. They are invertebrate and there are 3 classes of phylum Rotifera. And 100 and about 1800 are described in species. We can find Rotifer from anywhere that is not clean water. They make water into a green color, but some of them live in freshwater inhabitants. Rotifers are very important in these systems because of their incredible reproductive rates. It makes the Population of density of Rotifer could reach greater than 1000 per liter. Rotifers have eyes, corona, stomach, foot and toe. They have 8-12 chest legs and they make a wave with their front foot to get a prey. Rotifers are multicellular animals. Because they are so small most people have never heard of their existence. As we can see, they don't' have many of cells. They have less than 1000 cells, Even though they are small creatures, they have most of the body parts which are necessary for living. They have one or two light sensitive red eye spots, which can spot almost every organisms. There is an enormous variety of spectacular body shapes, all to suit the different lifestyles or environmental conditions. They can even be moved by wind, and they can be found at anywhere if there is a little bit of water. Even in a roof gutter or in birdbaths. And they move with their foot which has a sticky substances, so they can attach to a surface. Because of Rotifers assimilation ability, they are in a very important role in energy stream and cycling of nourishment. Rotifers give to both of the microbial loop and to higher trophic levels. And Rotifers could be necessary for characterizing lakes to trophic statue. Also, Rotifers usually are abundant in the water with soils reaching densities up to 2 million per meter of water. Rotifers are really small creatures, ranging in size from 100 to 2500 in microns. Most of them are free-living green-eating, bacteriovores or predators. Rotifers move by swimming or crawling on the bottom of the lake. Some of them are attached to freshwater plants permanently. All rotifers live in freshwater and make them fresher. 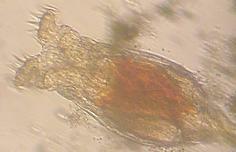 Rotifer can cause disease. They have already killed millions of people in the past in Europe. This is about plague bacillus that killed so many people. It happened like this. Rotifers got sick because of the bacillus, so it went crazy and starting biting everything they see and became contagious. Every people or animals that were bitten by Rotifer died without any treatment. The disease reduced the half of population of Europe. It has been illustrated that, contrary to old-earth evolutionary assumptions, Rotifers are actually an example of rapid evolution. The rapid evolution article was used by evolutionary biologist Peter Turchin as an example of the flawed methodology of evolution. "Ecologists studying population dynamics prefer not to bother with the possibility of evolutionary change affecting their study organisms," Turchin writes. "But [the study] decisively demonstrates that this simplification might no longer be tenable." ROTIFERS Wim van Egmond, Microscopy-UK, contributors 1995 onwards. Benthic Rotifers Unknown author, Copyright Schmid & Schmid, April 2005. Rotifer information unknown, Developments in Hydobiology 1:1-263., 1980. This page was last modified on 28 July 2014, at 19:03.